On the banks of the Pacuare River in Turrialba in the Central Highland of Costa Rica. 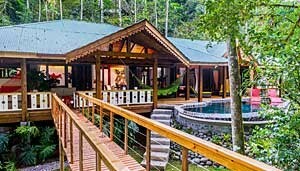 Pacuare Lodge is open year round. 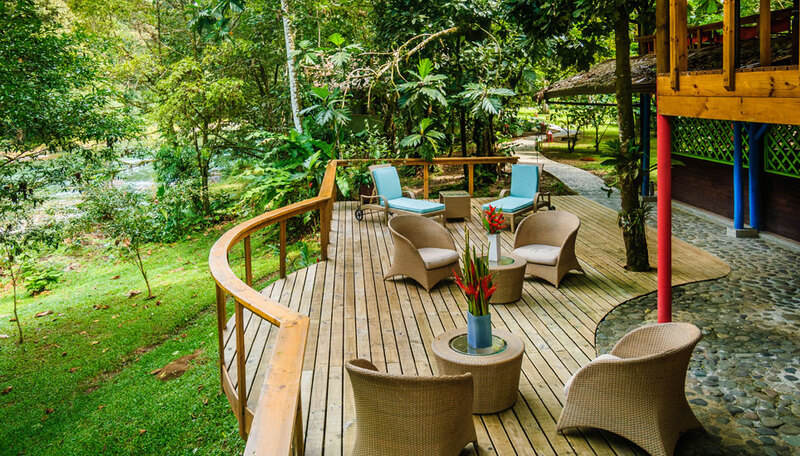 Hidden in the remote rainforest above the Pacuare River this lodge provides unexpected levels of luxury and comfort. Sumptuous suites have top quality beds, linens and bathrooms and each has a private terrace with your own view of the rainforest. 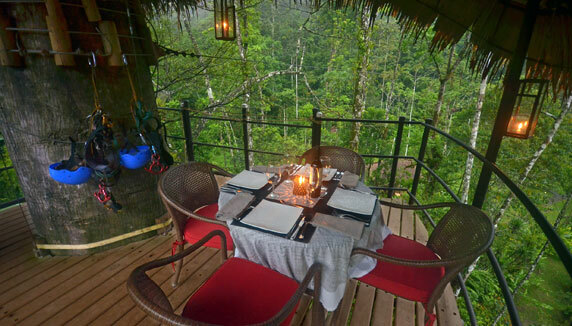 Meals are a showcase of local produce prepared by food lovers and during your stay you can share a romantic, candle-lit meal by the river with a loved one or dine in The Nest, a platform in the branches of a might kapok tree 20 metres above the forest floor. Activities include a choice of rainforest hikes, exciting river rafting and visits to local Cabecar Indian communities. Back at the lodge you can enjoy a swim in the infinity pool and indulge in soothing, restorative treatments at the spa, leaving you feeling deeply relaxed. 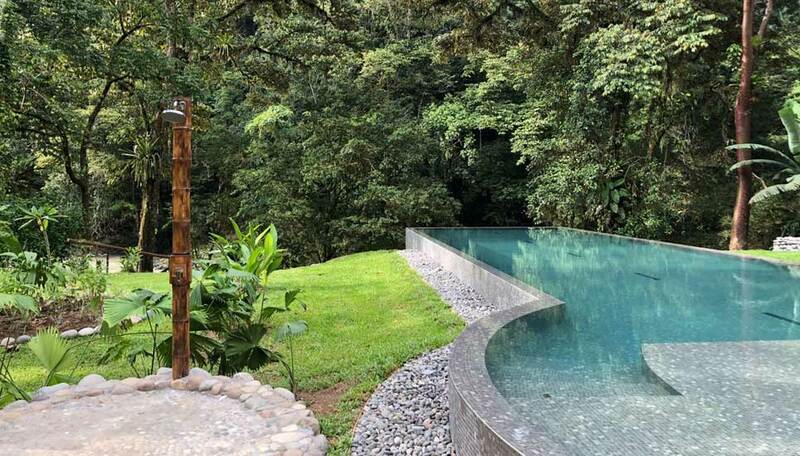 Why go to Pacuare Lodge? From the moment you arrive – either by raft on the river or gondola over the water – you know you’re in for a treat! 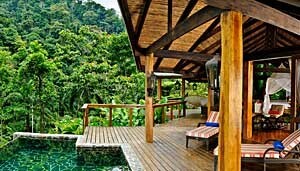 Pacuare Lodge is in a private reserve that is part of the largest network of protected areas in Central America. Daily excursions on foot and by boat enable you to penetrate the rainforest. 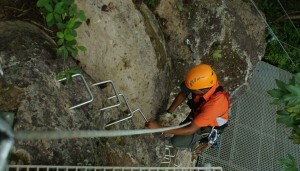 Thrill seekers will love the canopy zip wires and the canyoning adventure which combines hiking, climbing and abeiling, while others may opt for birdwatching and walking along paths used by native Indians for hundreds of years. This activity is balanced by time to unwind at the lodge, enjoying the secluded luxury of your suite, surrendering to the expert ministrations of spa therapists and savouring fine food in some a variety of locations including 20 metres up in a tree! The luxuriant rainforest that surrounds Pacuare Lodge is a private reserve that forms part of the largest network of protected areas in Central America, covering more than 1.2 million acres of tropical wilderness. With all this cover mammals are extremely hard to spot, though they are here and include the jaguar. Pacuare Lodge actively supports a project to study jaguars in the Pacuare Protected Zone, with the aim of developing conservation policies to protect this endangered species. Pacuare Lodge is a great birdwatching location due to the variety of bird species in the area. These include many exotic birds such as the sun bittern, red-throated ant-tanager, black-cheeked woodpecker and a variety of colourful toucans and hummingbirds. The rainforest is also rich in butterflies and exquisite tropical flowers. 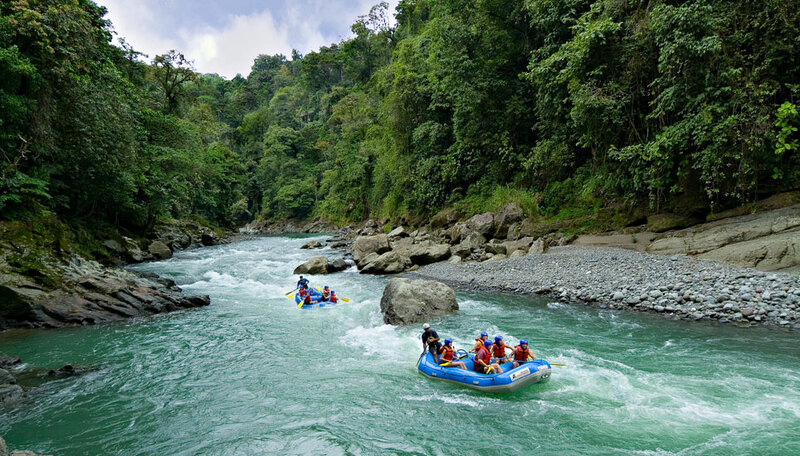 Prices from: £2,785 pp for 13 days One for adventure lovers and adrenalin junkies, as you raft, swing, hike and climb your way round Costa Rica – a country-sized adventure playground! Pacuare Lodge’s adventure package includes: transport from San Jose, services of a bilingual guide, breakfast en-route on the first day, Pacuare River rafting trip with professional guides and all equipment, accommodation and all meals at the lodge, hot drinks, sustainability tour, 1 hour hike to the waterfall, transport back to San Jose with guide, lunch on the last day and taxes. There are 19 suites and 1 villa all together. 8 River suites: these occupy 62sqm and are made from sustainable local materials including thatched roofs. Each has 1 king size bed or 2 twins, a private bathroom with shower plus a further outdoor shower, and a terrace with a hammock overlooking the gardens and rainforest. The 4 larger (91sqm) river view suites have similar facilities plus river-facing terraces. 1 canopy honeymoon suite: this secluded suite is set in the tree canopy and is reached by a private suspension bridge. 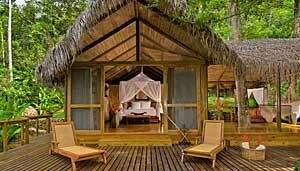 It has teak floors, a high thatched ceiling and screened windows with a 180 degree view of the rainforest. 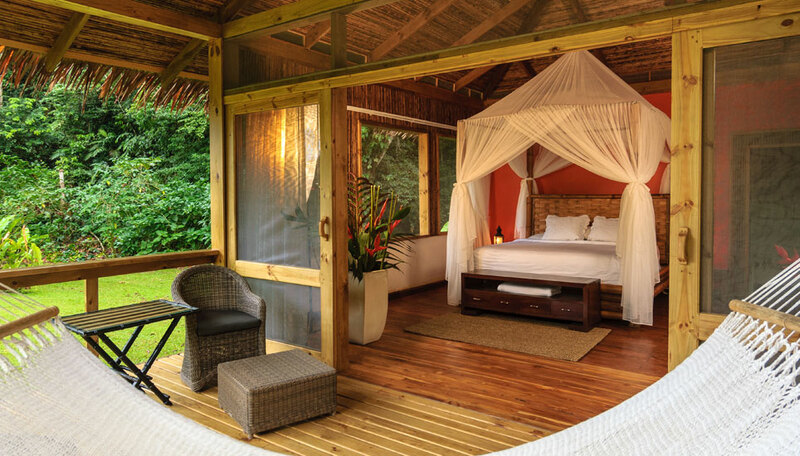 There is a king size canopy bed and a covered deck with a sofa and hammock. To the front is a large sundeck with a spring-fed plunge pool. The bathroom has 2 heated showers. 6 Linda vista suites: set on a high ridge with fine views over the Pacuare River these suites cover 230sqm. Each has a bedroom with king size bed, living room, bathroom with shower, an additional outdoor shower, private deck and terrace with a hammock and spring-fed pool. 1 jaguar villa: this lavish suite covers 350sqm and is the most luxurious accommodation of the lodge. It is reached via a private bridge and overlooks the river. It has a master bedroom with a king size bed, sitting area and bathtub, a living room with 2 daybeds, 2 bathrooms each with an indoor and outdoor shower, a private terrace with sitting area and hammock and a spring-fed pool. Additional amenities include a safe, telephone link to the main lodge and bathrobes.